UB’s division of University Communications (UC) is responsible for university-wide communications and marketing — including branding, media relations, digital (web, social media), editorial/content, and creative design — for the University at Buffalo (UB). The division is highly visible, nationally recognized, and its award-winning communication products represent the public face of the university. As a member of UC’s Digital Communications & Strategy team, you will help us transform the way content is created, distributed and tracked on social media, the web, and other digital communication platforms. You will support the department’s efforts to monitor and shape perceptions, fulfill information needs and provide exceptional service to external and internal audiences of UB. As our Social Media Assistant Analyst you will focus on helping to organize and mature the information and reporting systems in our best-of-class Social Media Management system (Sprinklr) and use it to analyze and report on UB’s impact in the social media landscape. This PAID student position requires a weekly commitment of 15-20 hours. Successful candidates will be available to work summer 2018 and ideally continue through spring 2019. All work (unless otherwise agreed) is to be conducted in UC offices in Crofts Hall on UB’s North Campus. Applications are being accepted immediately with a cut off of April 30, 2019. Start date is flexible. As our Social Media Multimedia Content and Engagement Assistant you will focus on promoting UB by creating multimedia assets – including graphics, GIFs, Instagram stickers and social videos (such as Instagram Stories) as well as video content that tell our distinct UB story and inspire our online audiences. Additional tasks include curating and producing innovative, thoughtful and inspiring content for social media, and monitoring and engaging with online audiences. You will also learn to how to communicate on behalf of the brand and capture UB’s distinct mission and culture. This PAID student position requires a weekly commitment of 15-20 hours during the academic semester and 20 hours during summer 2019. Hours are available during breaks. Have a keen sense of individual responsibility and initiative. Enthusiastic team player. Be able to handle multiple and varied assignments. Effective time management and adherence to deadlines. Be a strong verbal communicator. Canada/USA Mathcamp is looking for graduate students as leaders for its summer 2019 session. Be a leader in a vibrant community of talented and enthusiastic high-school students and energetic faculty. Teach and learn what most interests you, in an atmosphere of freedom and excitement. Be a friend and mentor to 120 marvelous kids. Be an architect of an experience that those 120 kids will cherish for years. Canada/USA Mathcamp (www.mathcamp.org) is a summer program for talented high school students from all over the United States, Canada, and the rest of the world. At Mathcamp, students interact with world-class mathematicians, explore advanced topics in mathematics, and find a true intellectual peer group. The mentor job is a hybrid between a teaching position and a camp counselor role. Your primary responsibility is to teach great classes, and you’ll be doing this in the context of a residential summer program: you live, eat, and play with the campers. It’s a lot of work and a lot of fun. As a mentor at Mathcamp, you get an amazing teaching experience: there is no set curriculum, so you create your own classes and teach the math you’re interested in. From group theory to projective geometry, from complex analysis to cryptography, from fractals to voting theory – there is an abundance of mathematics that can be taught (with a little imagination) at camp level. You’ll have support (in both curriculum design and pedagogy) from master teachers, and you’ll work with students who are exceptionally smart and engaged. Mentors are also the camp’s primary leaders and organizers, and cultivate the rich life of the camp by planning activities, setting camp policy, and serving as residential counselors—essentially, running the camp, and bringing it to life with creative ideas, inside and outside the classroom. Initiative, flexibility, and tolerance for a certain degree of chaos are a must—that is part of what makes Mathcamp an exciting place to work! Since women and minority students often face a shortage of role models in mathematics, we are especially eager to recruit mentors from these groups. For more information on the position and how to apply, visit http://www.mathcamp.org/mentor/. I wanted to reach out to you because we are currently looking to hire several creative, innovative and detail-oriented students to help us tell the UB story on the institution’s primary social media accounts. These paid positions are a wonderful opportunity for anyone who would like to challenge themselves to grow their creative, problem solving, storytelling, human behaviors or critical thinking skills – or for students who want to build skills in communications on social media. Honors students really do well with us. Their humor and creativity make them outstanding candidates. And as you know, many of the honors students you have placed with us have gone on to do great things. Our Video and Content students not only craft stories (including video content), but analyze performance. Our Operations students collaborate to design and mature our information and measurement systems and information architecture in our best-of-class Social Media Management system (Sprinklr) uses it to analyze and report on UB’s impact in the social media landscape. We prepare our students for careers in social media marketing and our past student assistants have gone on to have incredible experiences. In the last few years alone, our students have secured internships and jobs at global companies such as Hulu, Casper, The Smithsonian Institution and more. 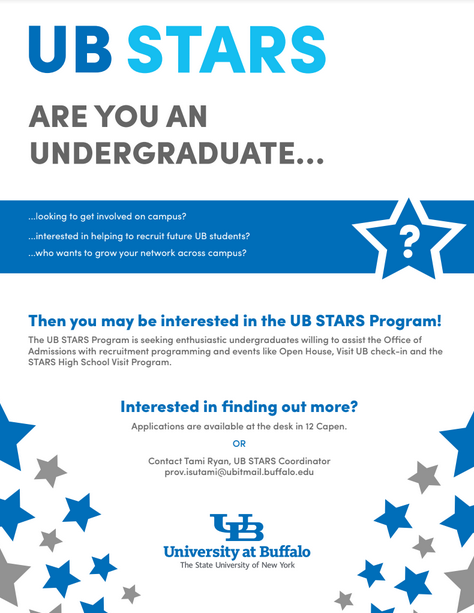 Please feel free to share with students or faculty members who would know of any stand-outs student to work with us as we continue to elevate our UB social media channel performance. This paid position does not have a tuition waiver; however, it is a great learning position for experienced students with skills that they want to sharpen in this area. Previous office work, desired but not necessary. Manager. Work assignments can be assigned from all Honors College professional staff members. Applications due December 7th, 2018. The Career Experience Program, supported by the NYS Centers of Excellence in Bioinformatics and Life Sciences and in Materials Informatics, pays UB students to work at local life science or engineering companies. The positions companies are seeking to fill are varied and cross a range of disciplines, including engineering, graphic design, grant writing, lab sciences, computer science and business. The positions are paid $13.50/hour and are for a total of 144 hours during the Spring 2019 Semester. These positions are now posted in Bullseye and companies are ready to hire! Search by Keywords, “Career Experience Program”. Peer tutoring is a rewarding experience that allows you to serve your fellow students and gain valuable experience while doing it. ARC tutors can make a big difference working with their tutees and also hone their own skills in the process. Our team consists of more than 60 tutors who help in high-demand subjects and courses. We also have academic coaches who work with students holistically, dealing with stress related to classes, time management and study strategies.